The leaves have been beautiful this year and have lasted longer than usual. I could see some of the leaves from inside the house. Our yellow maple was in full bloom on October 29 and we took a number of pictures. This Fall has been one to remember. 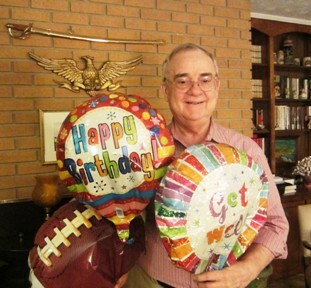 On October 3, 2011, I had a total right hip replacement at St Mary’s Hospital. My surgeon was Dr. Ormande Mahoney of Athens Orthopedic Clinic. It was my first serious surgery. My mobility was limited to a walker for three weeks and Lortab was not friendly to my concentration. Home Health Physical Therapy got me to moving and I was walking outside with a cane in the sunshine in my fourth week. The fifth week I started driving and working at the office on a half day basis. Last week, I stopped using the cane and I am walking with a slight limp. Physical Therapy at St Mary’s at the Exchange on Daniells Bridge Road is improving my walking and limp. The operation was a real success- I helped take up the offering at church last Sunday! The leaves have been beautiful this year and have lasted longer than usual. I could see some of the leaves from inside the house. Our yellow maple was in full bloom on October 29 and we took a number of pictures. When I was able to go to the office, the drive along the Oconee Veterans Parkway, Athens Loop and GA 36 was a pleasure. I managed to take some pictures. With an approaching freezing weather and rain and wind, I took a lot of pictures on November 15. Several in our yard were great along with the one of Friendship Presbyterian Church.It has been a great time to be alive! With friends, we have watched all the UGA Football Games. After the Boise State and South Carolina games, we were disappointed and discouraged about Georgia ever having a championship again. However, they started winning and winning! It even felt a little like old times when we beat Florida 24 to 20 on October 29. They really had it together (much talent on display) in the New Mexico Game- even though it was against a weaker opponent. As we approached the Auburn game, I was somewhat anxious and felt the DAWGS may have been overrated. However, they played a perfect game and STOMPED Auburn 45 to 7! My friends and I then felt that if we got to the title game in the Dome, we could at least play a respectable game. The sluggish Kentucky Game somewhat tempered our enthusiasm. We now have to deal with GA Tech which will be Fired Up to beat GA. The DAWGS will need to be on their game. I believe they and the coaches will see to that. GA beat FLA 24 to 20 on 10.29.11-!!!!! 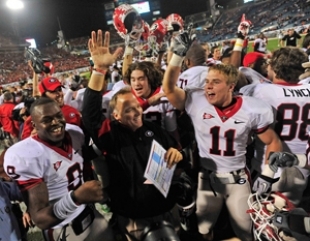 ATHENS, Ga. — Aaron Murray threw four touchdown passes to surpass Matthew Stafford's school record and No. 14 Georgia romped past No. 24 Auburn 45-7 Saturday, moving within one win of playing for the Southeastern Conference championship. The Bulldogs (8-2, 6-1 SEC) won their eighth in a row with a dominating performance in the Deep South's oldest rivalry. They raced to a 35-7 halftime lead over the stunned Tigers (6-4, 4-3) and finished with their biggest win in the series since 1946. Georgia can clinch its first division title in six years at home next weekend against Kentucky. Overall, a nice fall and one to remember – a fine time to be alive! On a sad note, UGA fans lost a treasure in Larry Munson who died November 20, 2011. Many of us have listened to him and loved his game calling for years. We had many an excited experience with his broadcasts. GA Fans will miss Larry! This video of Tribute brings back some highlights of his career.